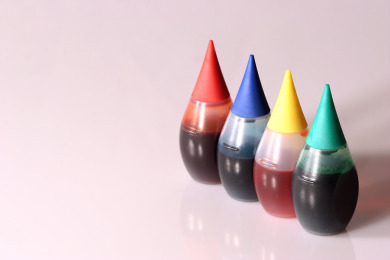 When the word ‘Food Coloring’ comes to your mind, you usually think about adding it in food like cakes, Easter eggs and pastries to get a colorful, delicious and savory food in the end. But will you be able to believe it if one says that food coloring can be efficiently used to dye your hair? Believe it or not, but it is true! Food colors can be used to dye hair, you can now experiment with your hair, get cool and funky colors in a much easier way at your home! The hair dyes available in the market are usually harsh for our hair, as they contain oodles of chemicals unsuitable for our hair. But by using food color as a dye, you can get to color your hair naturally, without harming your hair as they don’t comprise of harmful chemicals. 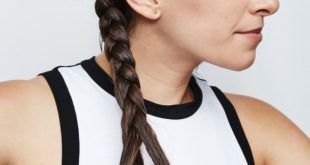 You can use food color to color your entire hair with some freaky color, or the tips of your hair, or you can even get a streak done with it, all at home! 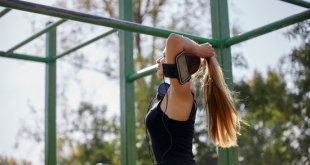 But it should be borne into mind that dyeing hair using Food color is usually a temporary procedure and the color may commence to come off in 2 to 4 weeks. So, let us get down to business and commence with adding vibrancy to our hair! A pair of gloves, preferably Latex. A conditioner or shampoo which should be preferably white in color. You can also use Aloe Vera gel instead of a white conditioner. It is recommended to test the food color of your choice on a single strand of your hair to know how much time it would take for your hair to saturate the food color completely. Wear the pair of latex gloves before commencing the work, because other than dyeing your hair, food colors usually stains the skin as well. So better protect your hands before starting with the coloring. 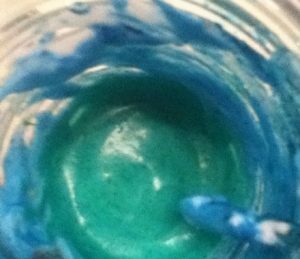 In a mixing bowl, add a generous amount of your favorite white colored shampoo/conditioner and then to it empty the entire bottle of food color you have chosen for yourself, and then mix them together. Now pour the mixed paste into an empty bottle (could be an empty shampoo bottle as well). 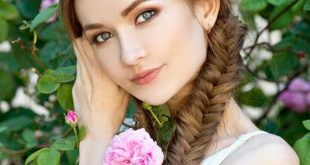 Be sure not to use a shampoo other than white color, because food color when mixed with a white base brings out the desired color of your choice more effectively. Now shake well the bottle containing the mixture of shampoo and food color. As the mixture becomes more viscous, add a little water to it and shake the bottle for approximately 2 minutes. This is done to make sure that the mixture is thoroughly mixed. Pour the mixture prepared by you on your hair from the bottle. Begin from the top of your hair and work down your way towards the bottom, making sure to apply the mixture at the roots of the hair. You can use a comb or a toothbrush to evenly distribute the mixture throughout your hair. If you have blonde hair or have hair which is light in texture, you should leave the food coloring for 30 minutes in your hair and then rinse off. If your hair is of a darker shade, leave the food coloring on your hair for 8 to 10 hours. It would be better if you apply the color and leave it overnight. The color would completely set in your hair and you can rinse off your hair with warm water till it is clear. Now dry your hair with clean towel. 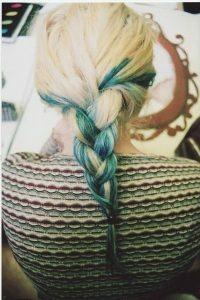 If you want to color just few of your strands instead of the entire hair, you can do so! Pull back and pin up the entire hair except the ones you want to highlight. With the help of a toothbrush, apply food color (mixed with shampoo) on your hair and cover the area with an aluminum foil. After applying the food color in your hair, do not wash or shampoo your hair for 3 to 5 days in order to preserve the color. It should be kept in mind that this is just a temporary coloring of hair which should last for 3 to 4 weeks. Old clothes should be worn when applying the food color, along with old towels. If it stains your skin, use lemon juice to remove it. Food coloring cannot assure covering the greys in your hair. It would rather add highlight to the grey portion of your hair. Mix clarifying shampoo and hair color developer in an empty bottle and shake the bottle well. 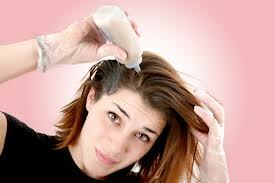 Rinse your hair with warm water and add clarifying shampoo in your hair. Now generously massage your hair until you feel it is evenly distributed throughout your hair. Wait for few minutes and then rinse your hair with lukewarm water. Now apply the mixture already made by you in a bottle and kept aside earlier. Wear a pair of gloves and apply it evenly to the rest of your hair. Keep it for 5 minutes and then rinse the hair with warm water. If the food color still doesn’t comes off, reapply the mixture once again, keep it for few minutes and then rinse your hair. At the end, apply your favorite conditioner to your hair, wait for 5 minutes before rinsing. Blow dry your hair and bingo! You get back your original hair color! So instead of consorting to using the dyes available in the market, you can use this much cheaper and effective version of dyeing your hair, which not only keeps your hair from being damaged, but also gives you an opportunity to work wonders with your hair at home instead of at salon!